Patented Diaphragm Design Assures Dependable, Repetitive, Bubble-Tight Sealing... and They Can Be Mounted in Any Position! Click here for a video comparison of ball checks to our patented diaphragm check! Patented Design: Self-sealing - they are not dependent on gravity, mounting position or reverse flow, a significant improvement over ball check valves. Silent Operation: No internal sliding or loose parts to slam or vibrate, chattering is eliminated! Dependability: Leak-free sealing protects against the potential hazards created by reverse flow of corrosive liquids such as acids, caustics and chlorine solutions. Repetitive Long Term Sealing: Diaphragm automatically positions itself against seat in the identical location. 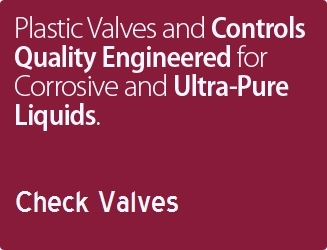 Superior to ball check valves which often leak at lower pressures. Convenience: Union nut on Series CKM simplifies valve inspection/removal with minimum piping breakdown. Minimal Cracking Pressure: Diaphragm begins to open at approximately 1.0 to 1.5 PSI. Cost Efficient: Designed to improve system performance and competitively priced. 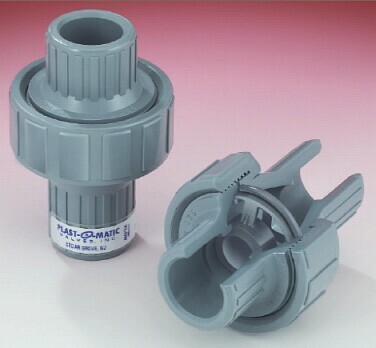 Great Selection: Molded valves available in Geon® PVC, Kynar® PVDF, glass-filled Polypropylene, and now Corzan® CPVC. 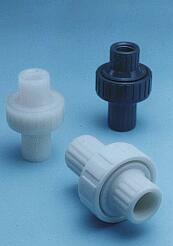 Series CK available in PTFE. This simple animation shows the valve starting in the normally closed position, opening, and then closing bubble tight with zero inlet pressure. Flow is from left to right. Part numbers shown are Viton seals with PVC bodies. For spigot or other connection types, consult factory. Part numbers shown have Viton seals. Tested under laboratory conditions with FKM (Viton) diaphragm. Maximum flow will not be achieved until the valve is cycled approximately 20 times. For specifications and catalog page in .PDF format, please click here. April 2004: Series CKM is offered in Corzan CPVC. Corzan CPVC (chlorinated polyvinylchloride) offers many of the same advantages of grade 1/type 1 PVC, with additional service temperature range to 180ºF. Corzan is a well known brand of CPVC resin manufactured by Noveon, Inc. Series CKM in Corzan CPVC is available for threaded or socket installation, with Viton or EPDM diaphragm.